Heat oil in a frypan. Toss lamb with flour and pepper in a plastic bag. 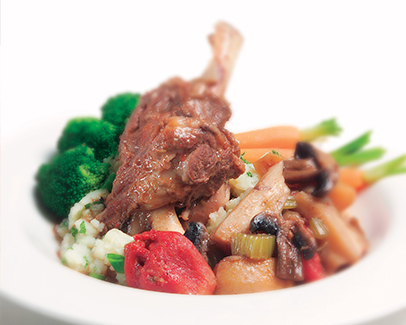 Remove lamb, pan-fry until brown on all sides and place in a large casserole dish. Add all vegetables except tomatoes to the pan and cook for 5 minutes, turning constantly until they begin to colour slightly. Tip in remaining seasoned flour from the plastic bag. Add tomatoes and water and stir into vegetables. Add herbs. Bring to the boil and pour over lamb. Cover closely with a lid and bake in oven for 2–2 ½ hours until meat is falling off the bones.